Letter to Scottish National Portrait Gallery Staff – BP or not BP? We are BP or not BP Scotland. We are a group of artists, activists and culture-lovers, staging a performance intervention in your workplace, to highlight the issue of increasing sponsorship of our cultural institutions by oil companies. As you know, BP sponsors the Portrait Award, and has a sponsorship contract with the National Portrait Gallery in London. We believe that the Scottish National Portait Gallery should take a stand and refuse to show the BP Portrait Award exhibition again until sponsorship has been changed. We are also urging the SNPG to do what it can to persuade its partner, the NPG, not to renew its sponsorship deal with BP. We apologise that our performance may create disruption in your daily routine, but this activity is not against staff. BP or not BP Scotland and the Art Not Oil Coalition support the PCS Union in their fight against privatisation at the National Galleries, against removal of weekend working allowances at National Museums Scotland, and their other struggles. 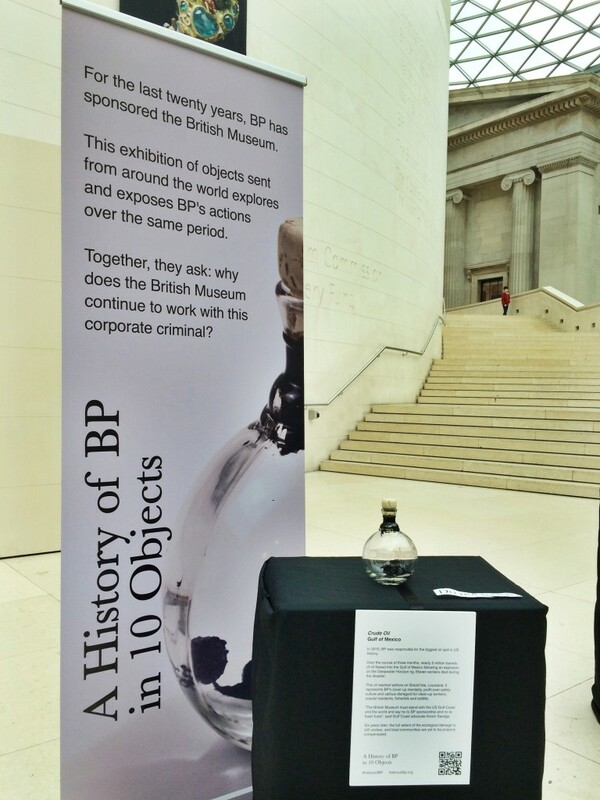 We greatly welcome the PCS policy passed in May 2015 – brought by workers from Tate – that condemns sponsorship by oil companies and arm traders in our museums & galleries. BP only provides 2.9% of the annual budget of the National Portrait Gallery in London, and less than 1% of the annual budget of Tate, British Museum and the Royal Opera House. We don’t yet know the figures for the Edinburgh International Festival and other large cultural institutions in Scotland, but we expect that they are also extremely low. In return, BP benefits from vast amounts of positive publicity, which it uses to distract from its environmental destruction, human rights abuses and climate change- fuelling business. Public institutions should not be in the pocket of oil multinationals, and the arts should not be exploited by big oil. Oil sponsorship and privatisation are two sides of the same coin. We welcome you to talk with us during the performance, and in the future.